William Atchison O’Neill took the oath as the 84th Governor of Connecticut on December 31, 1980, succeeding Ella T. Grasso who resigned for health reasons. Born in Hartford, Connecticut, on August 11, 1930 to Frances and Joseph O’Neill, William grew up in East Hampton and attended East Hampton schools, New Britain Teacher’s College (now Central Connecticut State University) and the University of Hartford. He sold insurance for Prudential Insurance Company and later served with the United States Air Force as a combat flyer during the Korean War from 1950-1953. Upon his return, he ran the family business — an East Hampton tavern where residents and politicians often met and where he, by his own admission, learned to listen. O’Neill was active in East Hampton civic affairs. He served on the town’s Zoning Board of Appeals, the Board of Finance, the Democratic Town Committee, and the Fire District Commission. In 1962, when he was aged 32, he married Natalie (Nikki) Scott Damon, a native of Leominster, Massachusetts. O’Neill entered state politics in 1966 when he won election to the State House of Representatives; he was returned to office in the next five elections. During his tenure in the House, he was Assistant Majority Leader (1971-1972), Assistant Minority Leader (1973-1974), and Majority Leader (1975-1978). O’Neill served as State Chairman of the “Ella Grasso for Governor” Committee in 1974 and as Chairman of the Democratic State Central Committee. “This afternoon, your time of challenge and promise begins. Your many years of positive and productive service to the people of Connecticut have provided you with the kind of skills and experience that will assure your success as Governor. Our citizens have always demanded the best from their elected officials, and I know that you will meet their needs with great commitment, concern, and compassion. O’Neill had not aspired to the Governor’s chair, but when Grasso resigned, he took control of the State at 4:30 p.m. on New Year’s Eve 1980. Joseph J. Fauliso, President Pro Tempore of the State Senate, succeeded O’Neill as Lieutenant Governor. As O’Neill stated in a press release dated March 4, 1982, “I never expected that the responsibility to govern our state would be thrust upon me. Believe me, until you actually sit in the Governor’s chair, you don’t have the slightest comprehension of the awesome responsibilities of this important job.” Those new responsibilities may have contributed to his heart attack and subsequent open-heart surgery in the winter of 1981. 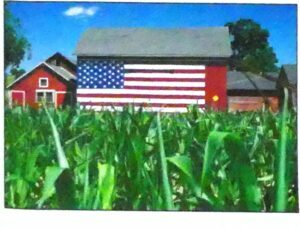 For his first two years, O’Neill continued and advocated Grasso’s programs. He also kept many of her loyal staff, including Charles M. McCollam (Chad) as Executive Aide, Legal Counsel Jay W. Jackson, and Press Secretary Larrye deBear. O’Neill did not make changes or pursue his own policies because he had not been elected in his own right. After his elections in 1982 and 1986, he instituted his own agenda. His major issues were the state’s economic health, infrastructure, education, care of the mentally ill and retarded, assistance for the elderly, and the environment. Among his accomplishments during his ten-year tenure were passage of the Educational Enhancement Act, which raised teacher salaries and standards; reorganization of the Higher Education system; enforcement of the Clean Water Act; and, in 1984, the appointment of the first female Chief Justice of the Supreme Court, Ellen Peters. In 1980, O’Neill inherited a $22 million deficit, an able cabinet and staff, growing state unemployment, and the Reagan-era federal budget cuts that had a negative impact on social programs. Five years later, the state enjoyed a budget surplus economic growth, low unemployment due to a booming economy, and improved infrastructure and clean drinking water, due in large part to O’Neill’s efforts. By 1990, however, the economy was again in a steep decline, the state faced yet another deficit, and polls showed a steady drop in O’Neill’s popularity. He decided not to run for a third term and retired to his home in East Hampton. Governor O’Neill characterized his approach to public service as being governed by a few basic rules: “to use common sense to solve problems; work with my colleagues to achieve sound and responsible government; and use my knowledge and experience for the benefit of all of our citizens.” (press release, March 4, 1982) His critics and his supporters agreed that he grew into the office after a shaky start. A January 7, 1987 article in the Hartford Courant described him as “a nice man with an honest face,” someone who is friendly, reasonable, and who has common sense, a man who never goes back on his word and who values loyalty and commitment. 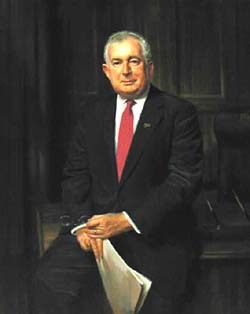 Governor O’Neill passed away on November 24, 2007. He was buried with military honors in the Connecticut State Veteran’s Cemetery in Middletown. A terminal at Bradley International Airport is named in his honor. “Achievements of the O’Neill Administration.” Internal paper, ca. 1985. State Archives Record Group 5, Office of the Governor, William A. O’Neill Records, 1979-1991, Series 3, Assistants’ Records, Sub-series 2, David McQuade, box 285, folder 73. O’Neill, William A. Educational reform in Connecticut: A Decade of Achievement. 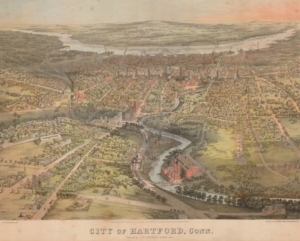 Hartford: The State,  [CSL call number ConnDoc G746 1980-1990 edre]. Oral history interviews with Governor O’Neill and former members of his staff, conducted by Bob Douglas for the Center of Public Policy and Practical Politics at Central Connecticut State University, 2001-2002. Niskanen, William A. Reaganomics: An Insider’s Account of the Policies and the People. New York: Oxford University Press, 1988. Pazniokas, Mark. “Simply a Leader; Gov. O’Neill Remembered as Common Man, Exceptional Politician,” Hartford Courant, November 30, 2007, digital images,Hartford Courant 1992-current ( http://www.proquest.com/ : 16 September 2008). Who’s Who in American Politics. Sixteenth Edition, 1997-1998. New Providence, NJ: Marquis Who’s Who, 1997 [CSL call number E 176 .W6424]. State Archives Record Group 5, Records of the Governor, Gov. William O. O’Neill. These records were recently processed with funding by the Center for Public Policy and Practical Politics, Central Connecticut State University. Much of the information in this biographical sketch came from information in the records themselves. Materials in the State Archives are subject to the Rules and Procedures for Researchers Using Archival Records and Secured Collections Materials. 43″ x 53″ in its frame, this view of Governor O’Neill sitting on his desk depicts how he often met and talked with visitors to the governor’s office. It was painted by William H. Whittingham and unveiled on October 17, 1991 at a 5 p.m. ceremony. Prepared by Barbara Austen, State Archives, Connecticut State Library, August 2002. Updated September 2008. 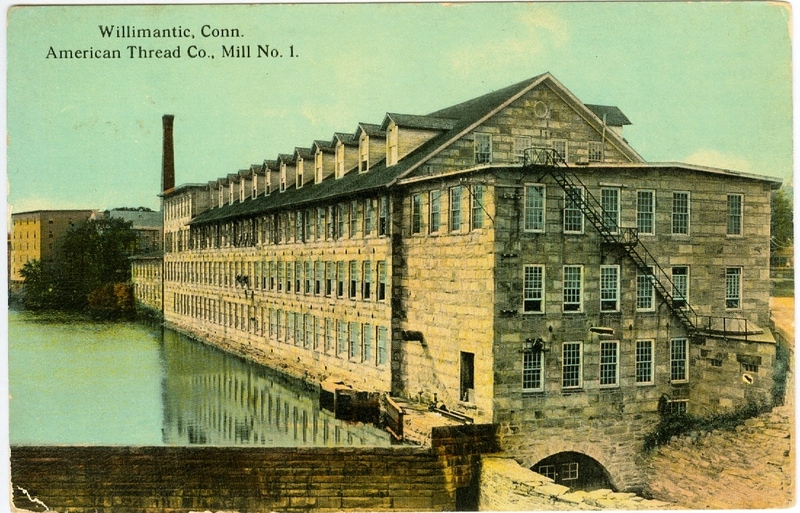 All rights reserved © 2002-2008 Connecticut State Library.